With 500 inches of champagne powder a year, Grand Targhee is your powder paradise in the heart of the Tetons! 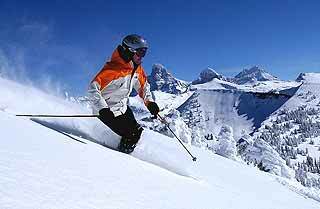 Ski Magazine has called Grand Targhee, "A place that dumps! ", and in their 2002 Reader Survey, they were ranked #2 in North America for snow. 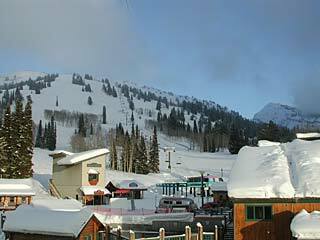 Grand Targhee consistently ranks #1 and #2 along with Alta, UT. Targhee is only a beautiful hour drive from Jackson Hole, WY, an hour and a half from Idaho Falls, ID, and only a short 5-hour drive from Salt Lake City, UT. Come visit the sunny side of the Tetons - you won't be disappointed! Directions: Directions from Idaho Falls Airport: Exit airport and turn left on Grand view Drive/Hwy. 20 (towards West Yellowstone). Proceed on Hwy. 20 for approximately 30 miles. After the third Rexburg exit and at the next exit, you will see a brown sign that reads "Targhee Recreation Area, Teton Hwy. 33" on the right. Take that exit and stay on Hwy. 33 to Driggs, ID. Go through town and turn left at the stop light on to Little Avenue. Follow Little Avenue for about 6 blocks. You will reach a fork. Bear left and the road becomes Ski Hill Road (no sign). Remain on Ski Hill Road. 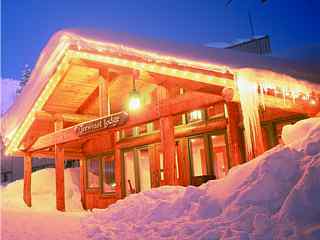 We do not have any current pre-built packages for Grand Targhee Resort . 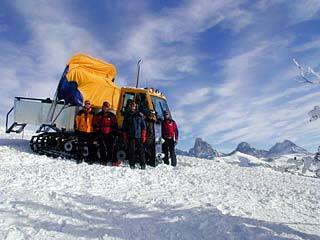 One of the hallmarks of the Grand Targhee experience is a Snowcat Adventure on Peaked Mountain complete with breathtaking views of the Grand Teton. For you and just Eleven other skiers or riders, a huge powder reserve of over 600 acres and up to 20,000 vertical feet in a day awaits. Come follow our professional guides through expansive bowls, gladed cruisers and steep tree pitches, with breathtaking views of the Tetons all around ï¿½ one of the greatest thrills in North America and the best cat skiing in Wyoming. Check out the video. Average Run - 2,000' Vertical Longest Run - 2,200' Vertical Daily Vertical - 14,000' to 20,000' Vertical Average Number Runs per Day - 10 to 12 Runs Two snow cats operate daily (conditions permitting) with a Twelve person capacity on each cat. 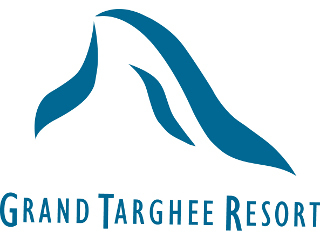 Grand Targhee Resort will not seperate groups based upon ability level. We ask that all riders are atleast intermediate level, able to link turns in all conditions and should be comfortable riding in trees and able to avoid natural obstacles. If you have limited experience in powder, we recommend taking a powder lesson with our ski & snowboard school prior to your scheduled trip. Snowcat Adventure Rates: Full Day Trip (9:00 AM - 4:00 PM): $349 (includes hot beverages, snacks & lunch). Check-in: Guests must report to the Activity Center in the Skier Plaza by 8:40am to participate in their Snowcat Adventure. A non-refundable deposit of $50 per seat is required at time of booking for each Snowcat reservations. Final payment is due 30 days prior to the schedule trip date. Reservations made within 30 days of the scheduled date for the Snowcat Adventure must be paid in full at time of booking. Cancel Policy: Cancellations made 30 days or more prior to the schedule Snowcat Adventure will result in the loss of the $50 non-refundable deposit. Cancellations made within 30 days and more than 7 days prior to the scheduled Snowcat Adventure will result in the loss of 50% off the full payment received. Cancellations made within 7 days of the scheduled Snowcat Adventure will result in the loss of full payment. The Grand Targhee Super Snow Guarantee! 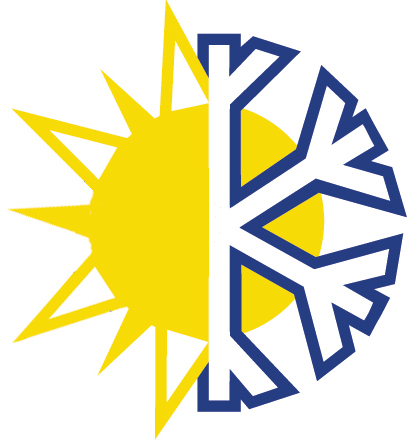 The resort is so confident that you will enjoy the snow conditions every day of the season, they offer a no-questions-asked SUPER SNOW GUARANTEE! If for any reason you are not satisfied with the snow conditions at Grand Targhee, simply return your lift ticket to the Ticket Office within one hour of the time of purchase and you will receive a "Snow Check" good for another lift ticket on any day during the same season. The snow check is non-transferable. From Jackson Hole, Wyoming Airport (JAC) (approx. 42 miles): 1. Exit airport. Turn right on Hwy. 89/191. 2. Go to the town square in Jackson (square will be on your left). 3. Turn right on Broadway towards Wilson, Hwy. 22. 4. Turn right on Hwy. 22/Teton Pass-Wilson ("Y" intersection at Phillips 66 station, follow right lane for exit). 5. Go through Wilson, Wy. and over Teton Pass (Hwy. 22, steep mountain pass, 10% grades, beautiful views). 6. Idaho state line is at west base of pass. Wy. Hwy. 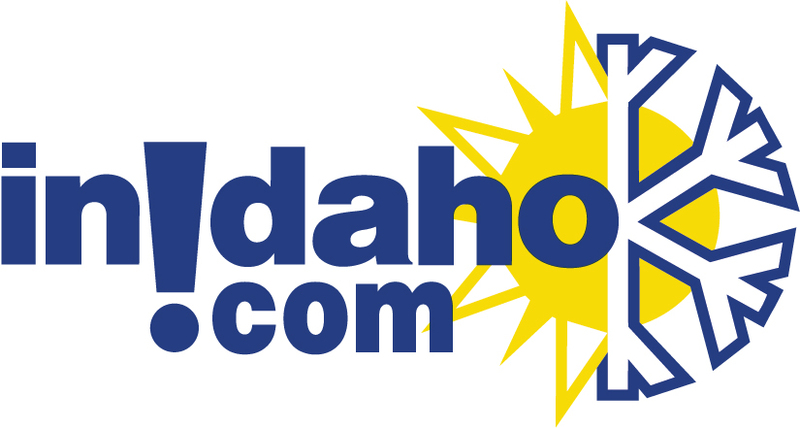 22 becomes Idaho Hwy. 33. 7. Follow Hwy. 33 through Victor, Id. to Driggs, Id. Turn right/East at the traffic light and Key Bank (Little Avenue/Ski Hill Road). 8. Follow for about 6 blocks. 9. You will reach a fork. Bear left and continue on Ski Hill Road. 10. Remain on Ski Hill Road through Alta, Wy. 11. 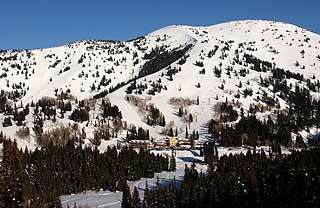 Ski Hill Road ends at Grand Targhee Ski and Summer Resort! From Idaho Falls, Idaho Airport (IDA) (approx. 87 miles): 1. Exit airport and turn left on Grandview Drive/Hwy. 20 (towards West Yellowstone). 2. Proceed on Hwy. 20 for approximately 30 miles. 3. 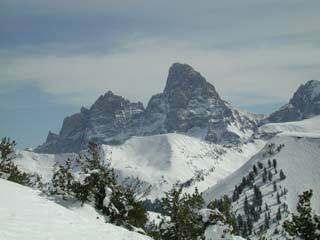 After the third Rexburg exit and at the next exit, you will see a brown sign that reads "Targhee Recreation Area, Teton Hwy." on the right. Take that exit and stay on Hwy. 33 to Driggs, Id. 4. Go through town and turn left/east at the traffic light and Key Bank on to Little Avenue/Ski Hill Road. 5. Follow for about 6 blocks. You will reach a fork. Bear left and the road becomes Ski Hill Road. 6. Remain on Ski Hill Road through Alta, Wy. 7. Ski Hill Road ends at Grand Targhee Ski and Summer Resort! From Driggs (approx. 12 miles) 1. Go through town on Hwy 33. 2. Turn East at traffic light Little Avenue/Ski Hill Road. 3. Follow for about 6 blocks. You will reach a fork in the road. Bear left and the road becomes Ski Hill Road. 4. Remain on Ski Hill Road through Alta, Wy. 5. Ski Hill Road ends at Grand Targhee Ski and Summer Resort. 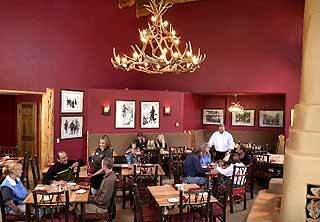 Learn more about lodging in the Teewinot Hotel located at Grand Targhee Resort. 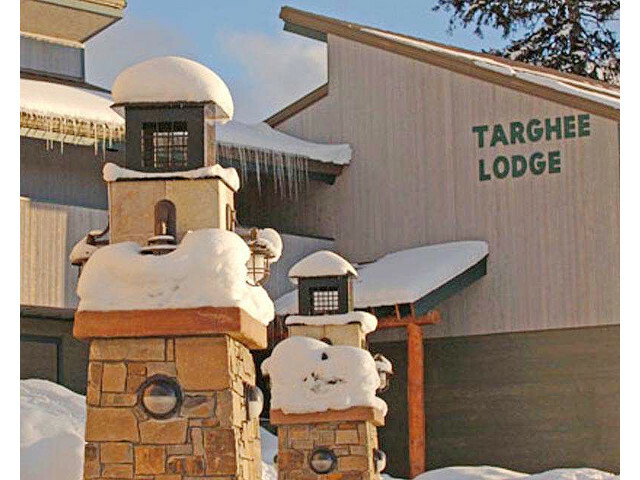 Learn more about lodging in the Targhee Lodge located at Grand Targhee Resort. 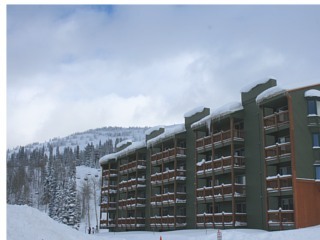 Learn more about lodging in the Sioux Lodge Condominiums located at Grand Targhee Resort. Please note: Guest reviews may mention certain amenities that may no longer be offered with Grand Targhee Resort. Please check the amenities prior to booking to confirm. "Chair lift maybe not was any specific. (please install bars/protection on blackfoot double lift. it is on safety limit.) But the ski area was wonderful! " 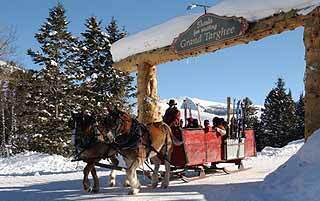 "Great ski mountain and village that is family friendly (lots of powder the 2nd day). We stayed right at the Village in the Teewinot and the hot tub, pool and dining was awesome!" Cancellation Policy**:(May vary with special rates, packages & online bookings) Winter: A deposit of one night's stay plus tax is required at time of time of booking. Payment in full is due 30 days prior to arrival. If you cancel outside 30 days prior to arrival; the initial deposit will be refunded less a $25.00 cancel fee. Reservations cancelled within 30 days of scheduled arrival will forfeit the original deposit, unless the cancellation is made within 14 days of scheduled arrival, in which case the entire amount of the reservation will be forfeited. Summer: Deposit of 1 night's stay plus tax is due at booking. Payment in full due 30 days prior to arrival. Cancellations made outside of 30 days prior to arrival, deposit is refunded minus $25 fee. 30 to 7 days cancel, deposit is forfeited. 7 days or less cancel, entire reservation amount forfeited. 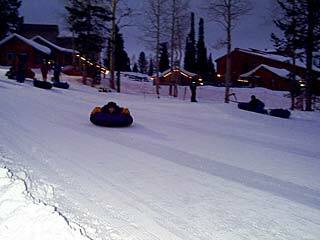 Snow Cat Skiing: Non-refundable deposit of $50 per seat is required at time of booking. Final Payment for each Snowcat Adventure is due 30 days prior to the scheduled date for each reservation.